Kanye West and Kim Kardashian want everyone to know that they are doing just fine. Rumors have been swirling for weeks that Kardashian and West are headed for splitsville. Its been reported that Kardashian has kept her distance from West since he was released from the hospital for exhaustion and alleged mental issues. But that may not be the case. 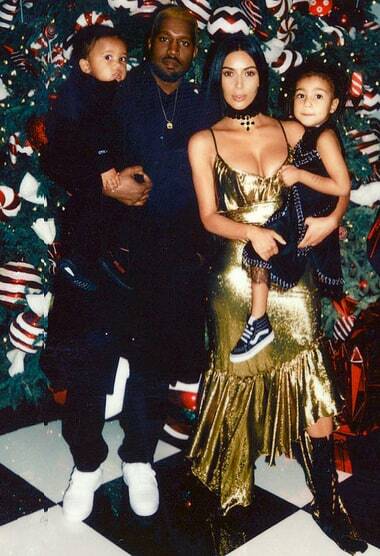 West shared a photo of his family on Twitter Tuesday with the caption, “Happy Holidays.” The photo, which was taken at Kris Jenner’s annual Christmas Eve party, shows West, Kardashian and children North, 3, and Saint, 1. Many still speculate that the photo is only to keep up appearances. The couple have stepped out together on a few occasions. People reports the two kept their distance and “barely spoke” during the Christmas party. Several sources have previously confirmed that the couple’s marriage has been under strain since West’s health crisis that was less than two months after his wife was robbed at gunpoint in Paris. West is reportedly seeking outpatient treatment. Kanye West Gives Kim Kardashian Similar Engagement Ring As Ex? !